Every day, Watch This offers staff recommendations inspired by the week’s new releases or premieres. This week: The Dark Knight takes on the Man Of Steel. Before picking sides in that title fight, check out these films about showdowns. Most crossover films pitting various characters from different series against each other are misleading, as they almost always ultimately favor one of the various attractions. Once a bunch of commercially viable elements are bunched together for one property, so to speak, decisions of dramatic emphasis must be made. Frankenstein Meets The Wolf Man, for instance, while serving as the fifth of Universal Studios’ 1930s- and 1940s-era Frankenstein films as well as a direct sequel to The Wolf Man, is really the Wolf Man’s movie. This decision should come as no surprise. The Wolf Man, or Larry Talbot, as he’s known in his human form, is played by Lon Chaney Jr., a recognizably poignant face of the Universal Monster canon, and his Wolf Man hadn’t been diluted by nearly half a dozen sequels. 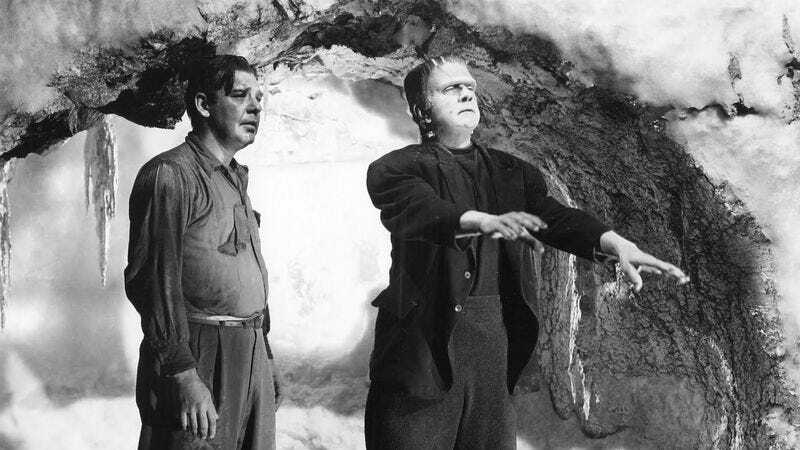 Frankenstein, or Frankenstein’s Monster, if we can be technical, had already been played by a variety of actors within his series, most famously by Boris Karloff and even by Chaney himself—devolving from an iconic creature, under Karloff’s care, into a more anonymously shambling brute with occasional shades of pathos. Bela Lugosi—once Universal’s Dracula, and more recently Ygor in the prior Frankenstein installment—assumes the Frankenstein Monster mantel in Frankenstein Meets The Wolf Man and he’s, well, forgettable. Frankenstein Meets The Wolf Man is the first of Universal’s crossover monster movies, and it isn’t nearly as confident in scope or pace as the subsequent House Of Dracula or House Of Frankenstein, which sent a variety of monsters and a collection of spurned avengers and creators scuttling on a series of overlapping adventures. This film follows a cautious, uncertain narrative, evenly bifurcating its plot so that it’s theoretically half a Wolf Man movie and half a Frankenstein movie. In the first half of the story, Talbot is released from his tomb by grave robbers and captured by doctors. In the second half, he tracks down the ruins of the Frankenstein castle, yearning to discover a secret to life and death that can enable him to commit suicide and end his werewolf curse. Yet the true Universal monster fan understands that the exposition, particularly in the various convoluted offspring of the franchises’ actual masterpieces, is where the “good stuff” truly lurks. Because the Universal monster movies, even at their least inspired, can be counted on for a heightened, fantastical atmosphere that still reverberates—all graveyards, with their slanted tombs and twisted trees; laboratories, with sound effects that suggest rusted New Year’s Eve party favors; and the breathlessly florid incantations uttered by supporting players. There are also icy catacombs and ruins and castles that are destroyed via gloriously obvious miniatures, all of which are tied together by a watered-down German expressionism that favors deep black shadows and the occasional canted angle. Frankenstein Meets The Wolf Man abounds in all these things, and it’s notable for testing the ground for all subsequent monster mashes. Availability: Frankenstein Meets The Wolf Man has been released numerous times on DVD; some version is available from Amazon or possibly your local video store/library. The film can also be rented or purchased through the major digital services.